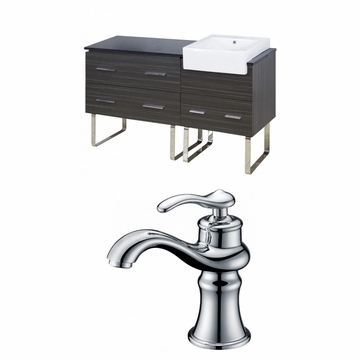 THIS PRODUCT INCLUDE(S): 1x bathroom faucet in chrome color (1779), 2x units of miscellaneous part in chrome color (542), 1x vanity base in dawn grey color (605), 1x vessel in white color (1581), 1x vanity base in dawn grey color (1582), 1x quartz top in black galaxy color (1583), 1x quartz top in black galaxy color (1743). Machine cut and taped for smooth chip-free edges. Constructed with solid plywood and decorative melamine. Single lever water and temperature control. Standard US plumbing connections. Three large drawers with soft-close slides and matching modern chrome handles. Faucet includes a high-quality ceramic cartridge. All mounting hardware is included. Drawer features undermount hidden drawer glides. Black Galaxy Quartz top for single hole faucet is non-porous with superior performance against staining, scratching and scorching. 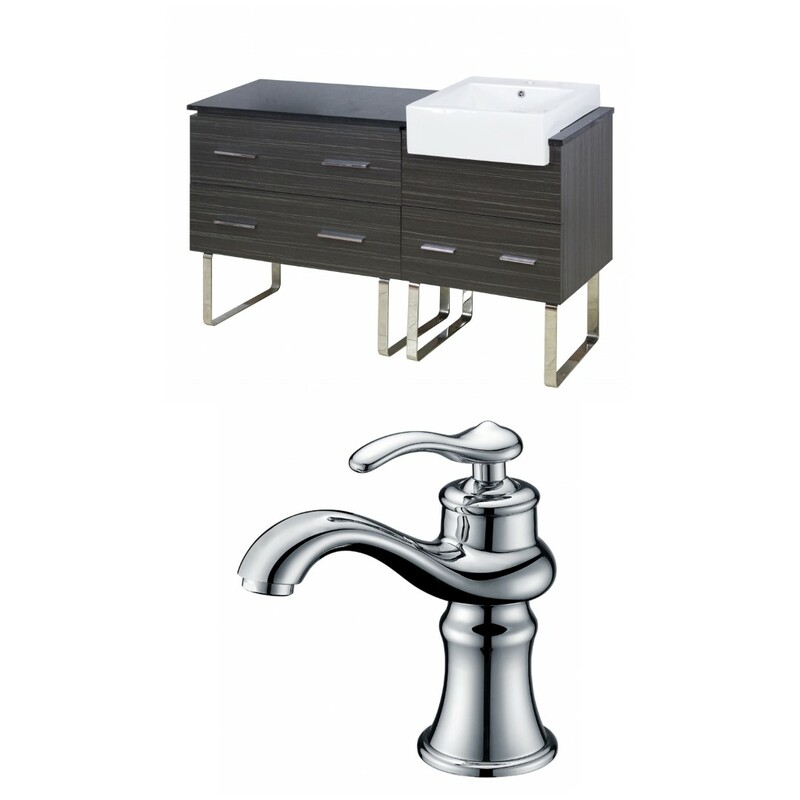 Faucet is constructed with lead-free brass ensuring durability. Designed for easy installation. No assembly required. Faucet is CUPC approved. Quality control approved in Canada and re-inspected prior to shipping your order. Multi-layer 7-step stain finish enhances the grains of natural wood and gives it a luxury look. Includes adjustable floor levelers under the legs for uneven floors. Knock-out plumbing backboard for easy water supply and drain access. Solid wood frame with no MDF or chipboard used. Faucet comes with hot and cold water lines. 20-in. W x 20-in. D Semi-recessed rectangular vessel features a white color with enamel glaze finish. Premium white glaze for a glossy finish. Kiln dried ceramic construction. Smooth non-porous surface prevents from discolouration and fading. Vanity is completely finished inside out including the back of vanity. Sink features an overflow.